NFL Draws Hundreds of City Kids | News and Features | Style Weekly - Richmond, VA local news, arts, and events. 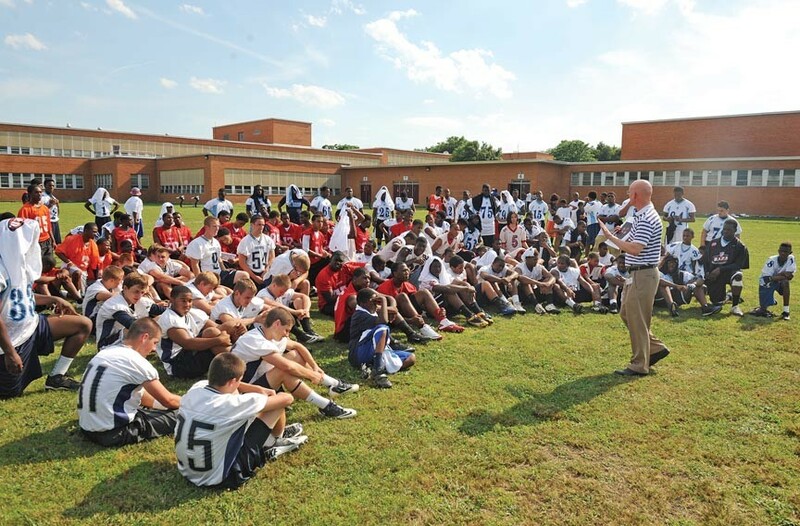 City Councilman Chris Hilbert talks to players after practice at John Marshall High School on Thursday. A rising senior at George Wythe High School, Tyreek Cox is one of the lucky ones. Surveying a field with more than 150 inner-city youth running football drills at John Marshall High School last week, the 17-year-old linebacker is being recruited by some of the state's top colleges, including the University of Virginia and Virginia Tech. Shane Beamer, assistant coach at Virginia Tech and son of head coach Frank Beamer, recently paid a visit. Cox says Beamer had a singular message: "Take the SAT," he recalls, breaking into a wide smile. "I'm taking it this Saturday." For the fifth time in the last eight years, the National Football League has brought its high-school player development program to the city in hopes of teaching young players proper techniques on the field. College and high-school coaches from throughout the region teach blocking techniques, tackling, quarterback drops and a variety of defensive schemes for certain positions. The camp moves on to Henrico County this week. In the city, however, the NFL training is desperately needed. Unlike the suburban counties, where school-sponsored programs start in elementary school, football in the city is underfunded. "We do not have middle-school programs," says Howard Hopkins, interim athletic director at Armstrong High School. "As a result of that, they have missed a lot of the foundational skills." Without the continuity, inner-city youth often end up on high-school teams playing organized football for the first time. City high schools also lack the resources for up-to-date equipment, such as shoulder pads and helmets, often leading to inexperienced players in substandard gear. "The issue is M.O.N.E.Y.," Howard says. While the Richmond School Board and Mayor Dwight Jones dicker over how to cut $15 million from the school budget, Howard worries that the real victims are here on the field. If only the city's political leaders understood the power of this game, he says. There are far more opportunities to obtain college scholarships through football because of the sizes of college teams, which often have 100 or more players. Basketball teams usually are only 15 or 16 players deep. Eric Harris quit his job as a juvenile probation officer and started his nonprofit, the Broken Chain Foundation, which aids at-risk families. He began working as a wide receivers and defensive backs coach at Thomas Jefferson. "I got tired of locking these kids up," says Harris, who played wide receiver at Virginia Union University. "I was one of them. I was one of the ones who wasn't going to do nothing with his life." If only the rest of Richmond could see how the city's young men respond to football, Howard says: "You can't get in trouble on the football field at 5 in the afternoon."